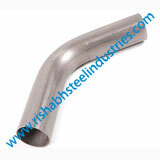 Dealers of Stainless Steel WP347 45 Degree Pipe Bend, Wrought Austenitic Stainless Steel 347 5D Pipe Bend, Stockholder Of Stainless Steel 347 10D Pipe Bend, 347 SS Mitered Pipe Bend, ANSI B16.9 Stainless Steel 347 3D Pipe Bends in Mumbai, India. 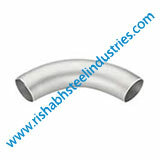 We are high quality ASTM A403 WP347 Piggable Bend Manufacturer in India contain 18% Chromium and 8% Nickel, and are the most commonly used pipe bend grade. 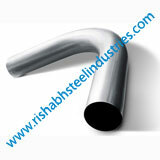 Being strong at room temperature and temperature low and moderately high, UNS S34700 SS 3D Pipe Bends have a bend curve which has a radius equal to 3x of the diameter of the pipe, these pipe bends are relatively low cost compared to other pipe bends and are resistant to atmospheric corrosion in refrigeration and pulp extraction industry. 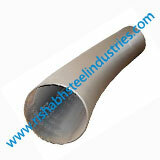 Besides combating general corrosion and offering effortless drawability i.e. 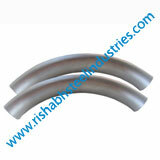 the ability to be drawn into various shapes, our WNR 1.4550 SS Hot Induction Bends undergo the hot induction process to get the perfect, precision-made body that snug fits a versatile amount of applications. 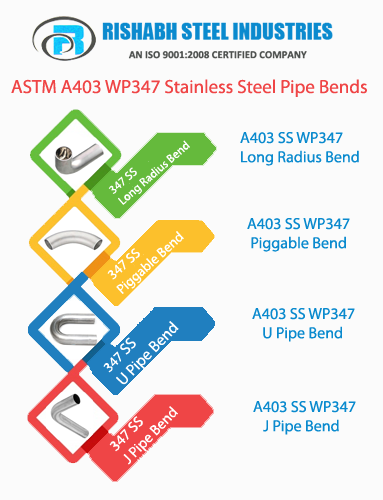 Also We offer wide range of Stainless Steel ASTM A403 347 Pipe Bends such as SS 347 Long Radius Bend, SS 347 Piggable Bend, SS 347 Hot Induction Bend, SS 347 Seamless Pipe Bend, SS 347 Welded Pipe Bend, SS 347 U Pipe Bend, SS 347 J Pipe Bend, SS 347 Mitered Pipe Bend, SS 347 3D Pipe Bend etc. 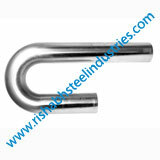 Rishabh Steel Industries Is An ISO: 9001, 14001 & OHSAS: 18001 Certified Company.We Manufacturer Our Products By High Grade Material To Provide Good Quality Stainless Steel 347 Pipe Bends To Our Domestic And Overseas Customers. 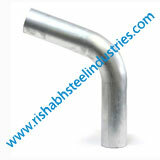 Bends accomplish a Lot of admiration by our clients owing to its high strength, dimensional correctness, high tension power, corrosion resistant and consistency products like UNS S34700 SS 3D Pipe Bend, WNR 1.4550 SS Hot Induction Bends & Stainless Steel ASTM A403 347 Pipe Bends. 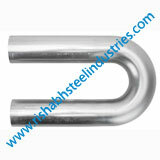 These products are used in various commercial, industrial and automobile industries. 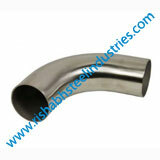 We manufacture ANSI 347 Welded Pipe Bend using high grade of raw material by implementing most ultra modern technology. 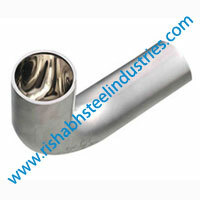 These products are clients can avail from us at various sizes, shapes and design as per the requirements.We are one of the top Manufacturers and Suppliers of ASTM A403 SS 347 Pipe Bend in Mumbai, India. 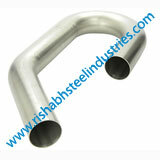 Best Price of 347 SS Mitered Pipe Bend Exporter, Wrought Austenitic Stainless Steel 347 5D Pipe Bend, Stockholder Of Stainless Steel 347 10D Pipe Bend, ASME SA403M Stainless Steel 347 Customized Pipe Bend Wholesaler, Stainless Steel WP347 45 Degree Pipe Bend Traders in India. 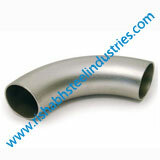 347 SS 180 degree pipe bender, SS 347 bend dimensions, SS 347 Pipe Bend price list, Best Quality 347 Stainless Steel Pipe Bends, SS 347 Pipe bends dimensions pdf, Small size pipe bending, 347 SS 180 Degree pipe bend Manufacturer, Supplier in India.